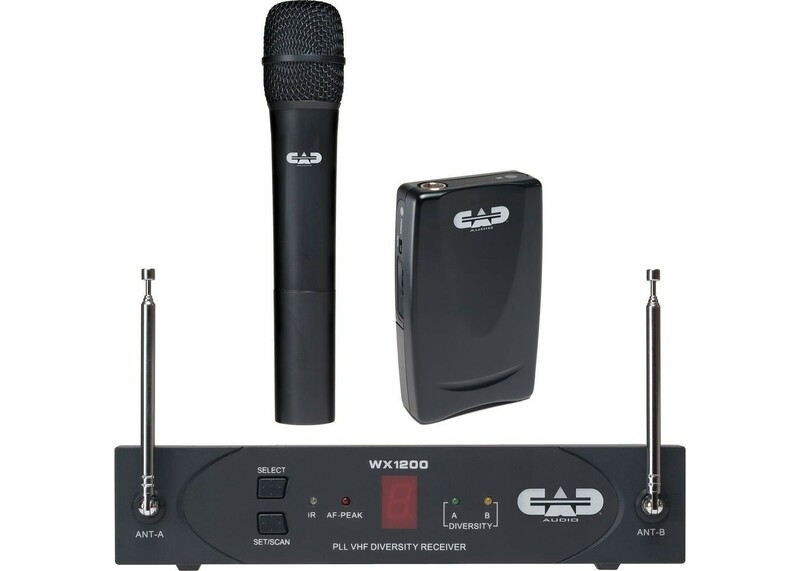 The CAD StagePass WX1220 Handheld and Bodypack Wireless Microphone System is intended for live sound reinforcement. 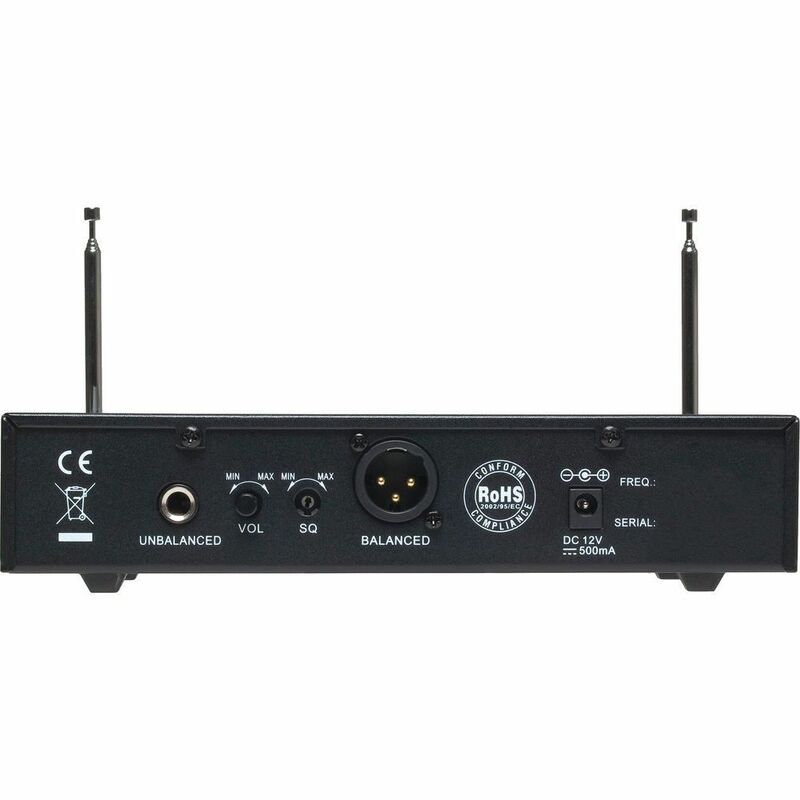 The system consists of a VHF receiver station, a handheld wireless dynamic microphone transmitter, and a wireless bodypack transmitter. Both the handheld microphone and the bodypack transmitter feature a soft-touch on and off mute button. Both also operate on two AA batteries and will last for more than 10 hours before requiring recharge or replacement batteries. The transmitters link with the receiver via an infrared sensor, and the transmission channel is automatically assigned by the system depending upon the RF conditions at the time. The VHF receiver features two antennas for diversity reception, a channel scanning button, a channel select button, a channel display, and indicator lights for IR, AF Peak, and antenna A and B diversity. For operation, the system automatically scans the RF environment and selects the best transmission frequency from 16 available channels. Alternatively, you can manually select the transmission channel. 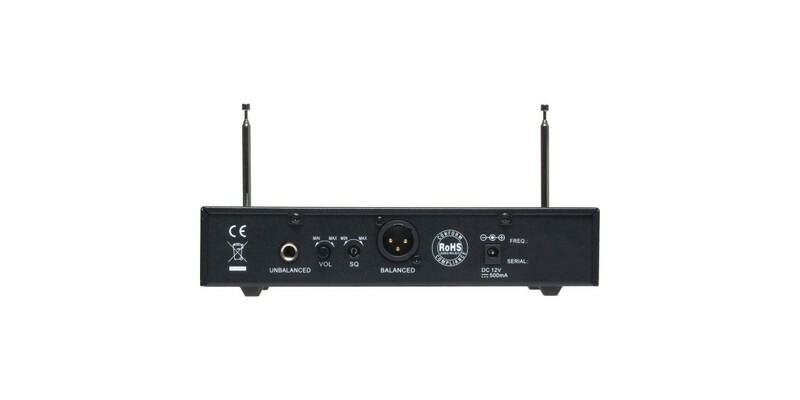 The back of the device includes a DC power jack, a volume control knob, a squelch control knob, a balanced XLR output, and an unbalanced 1/4" output. 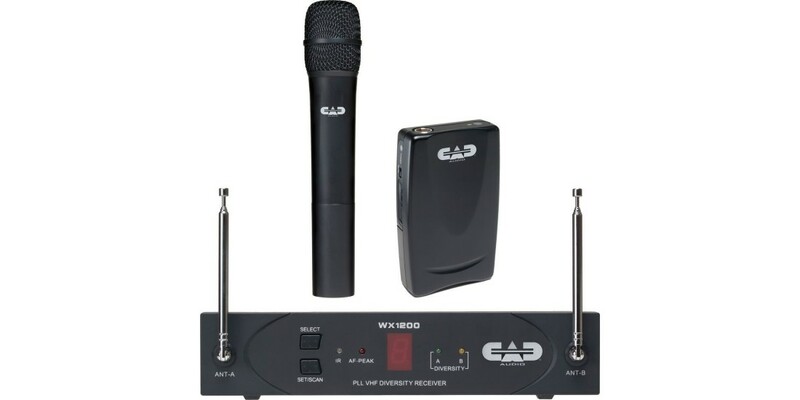 Dimensions (W x D x H) 9.5 x 4.5 x 1.6"
Dimensions 2.56 x 4.25 x 0.94"
CAD 302 Cardioid Condenser Headset Microphone with..
CAD Rack Bag for 1 or 2 Wireless Microphone or In ..